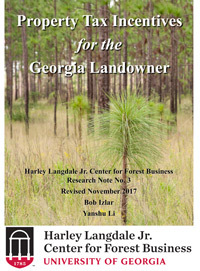 This is the sixth revision of the popular Property Tax Incentives for the Georgia Landowner, University of Georgia Harley Langdale, Jr. Center for Forest Business Research Note Number 3. It expands the June 2012 revision to include an exhaustive treatment of all pertinent ad valorem taxation legislation, Department of Revenue rules and regulations and some court cases through the 2017 General Assembly legislative session. Each intervening year has seen some change to ad valorem tax law relating to farm and forest owners including the landmark 2008 Forest Land Protection Act.